I love the whole card design process: coming up with the concept, drawing and painting the illustration, writing and lettering the verse, and composing the finished card. I also love knowing that my art and words help people stay connected and celebrate special moments. When I’m not designing, I do a lot of grief support work, and have discovered that people who know someone cares about them tend to be more resilient. That’s one of the things which led me to start creating products like the Care-Moji Textable Sticker Collections which give people tangible ways to reach out in kindness and show they care. Sending a card to a friend going through a challenging time is a great way to do this! 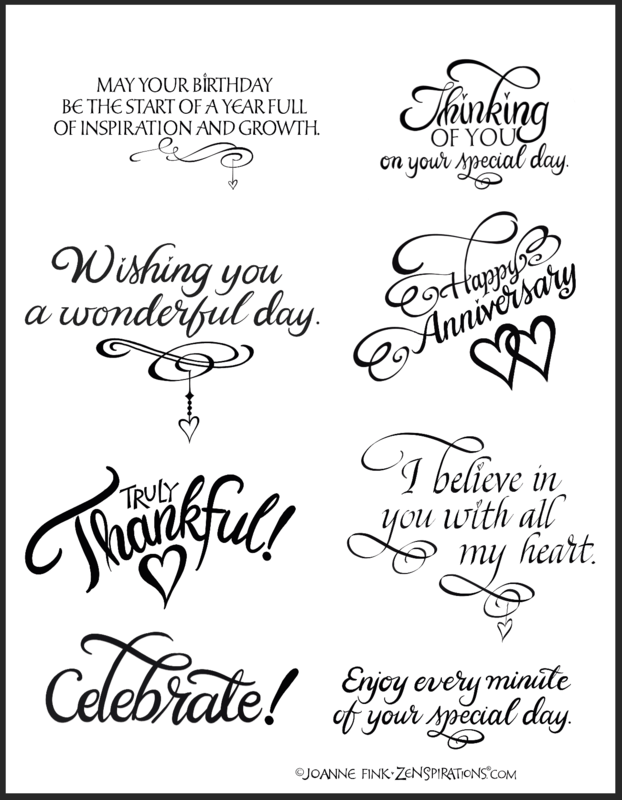 So in addition to designing finished cards, I also have been working on designing rubber stamps and dies that you can use to make your own greeting cards. 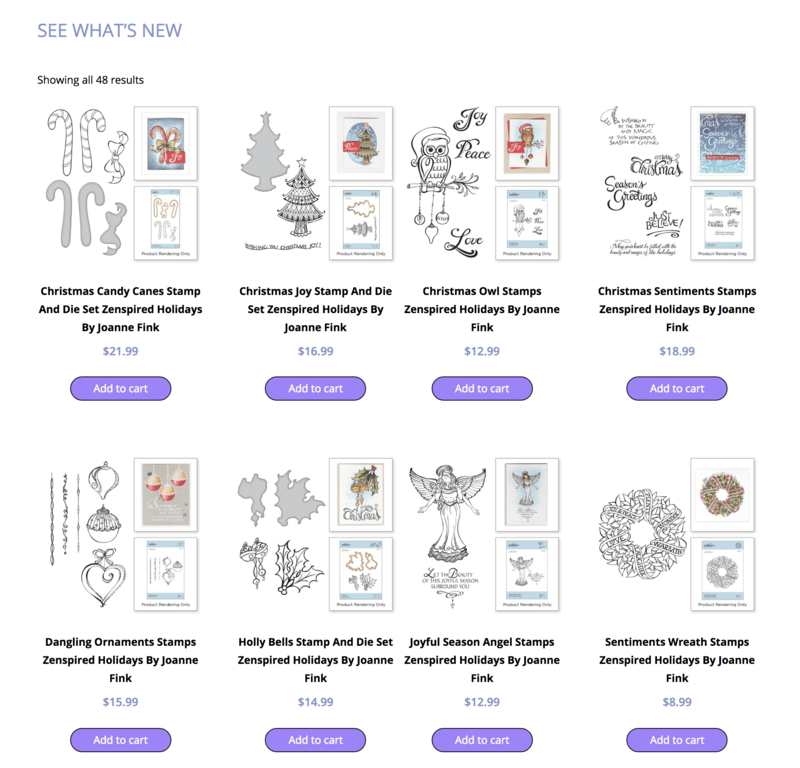 And, I’m really excited about my new Spellbinders Zenspired Holidays line because there are so many thing you can do with them. The candy cane below is a good example. On the more traditional version below, I love the little jingle bells, and the sentiment which is ghosted in the background. 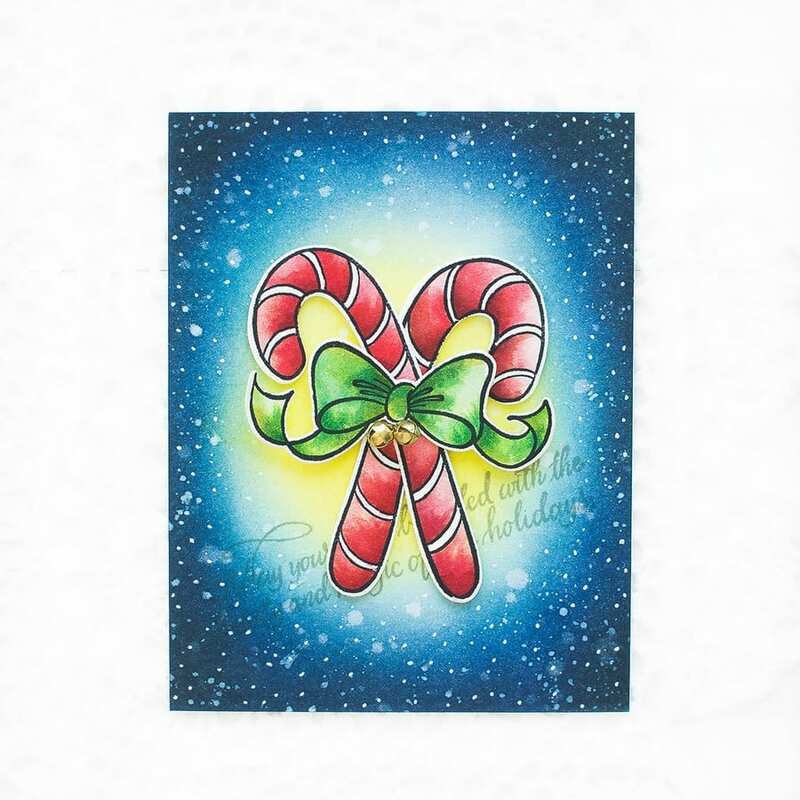 Both designs also feature a rubber stamp sentiment from the Christmas Sentiment Stamps. Since there are so many card crafter in the Zenspirations® community, I’m planning to share some step-by-step project tutorials this fall. Please take a look at the line, which is brand new in the Zenspirations Webstore, and leave a comment letting me know which one(s) you’d like to see used in a project. 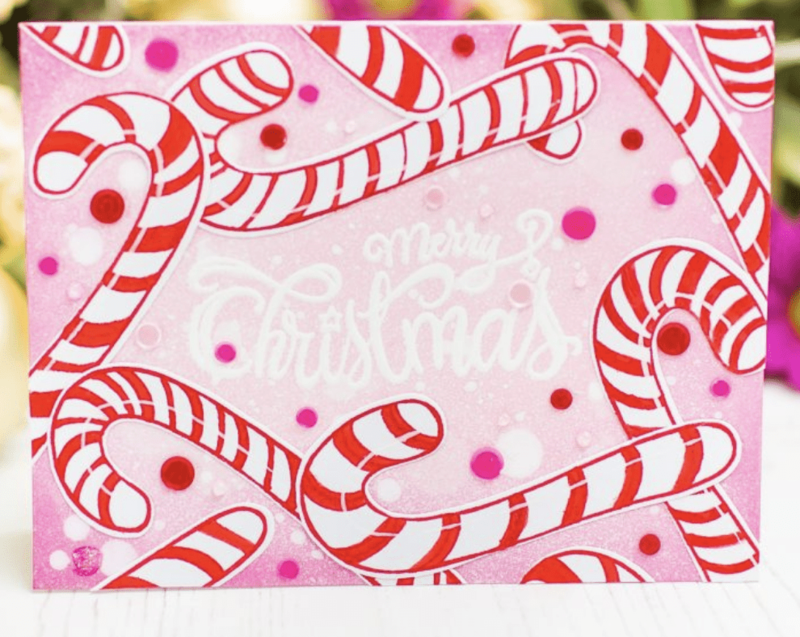 And if you enjoy card crafting, but prefer coloring to stamping? 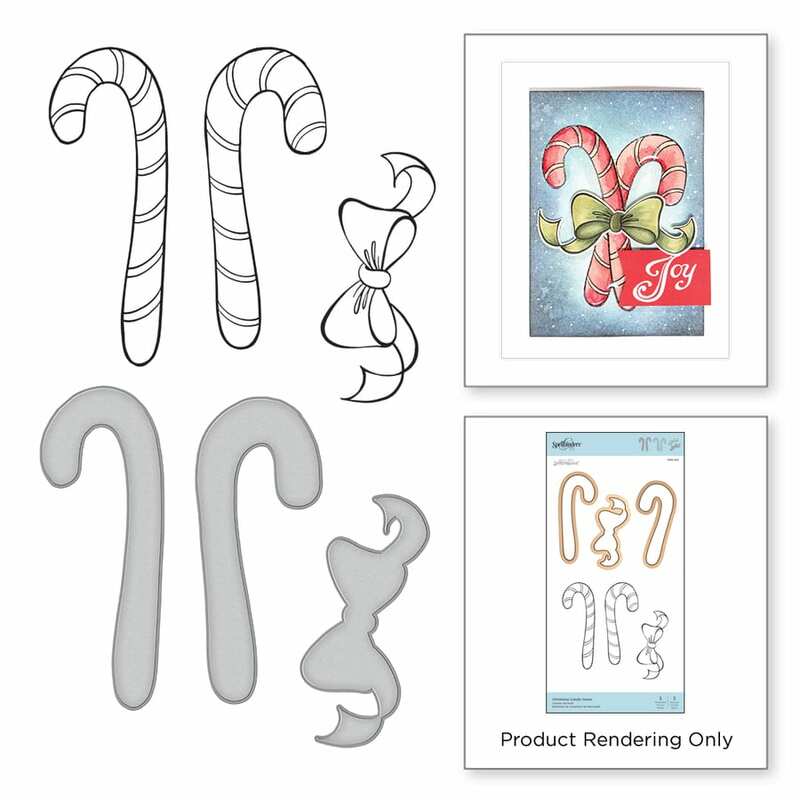 No worries, I created a Deluxe Downloadable Card Crafting Kit just for you! It comes with 12 different designs which you can print on an 8.5 x 11 sheet, trim to 10 x 7, and fold in half to get a standard 5 x 7 card. 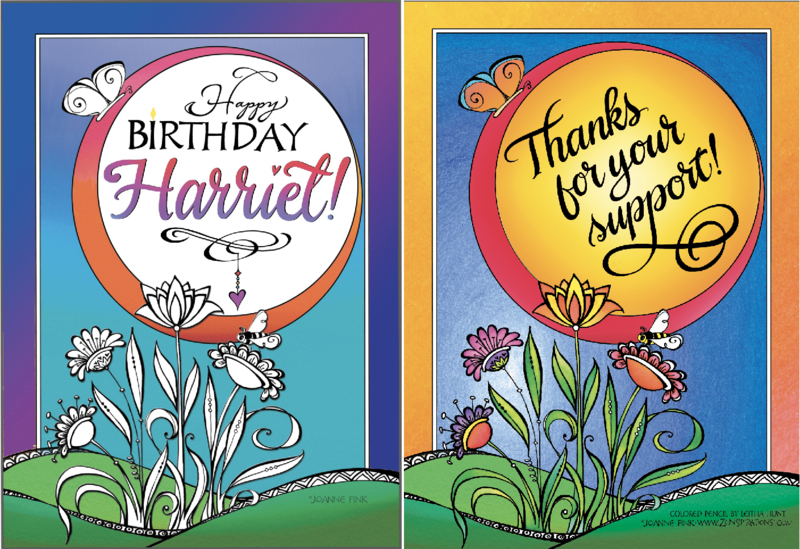 The designs are super flexible– most can be used for everything from birthday to encouragement, friendship to sympathy. And to make it really easy for you to create awesome cards, I’ve included 6 pages of card verses! There’s a page each for Get Well, Thank You, Friendship, Love, and Birthday sentiments, and a page with assorted messages. The collection is only $7.99, and you can print the designs out as many times as you want (for personal use only, please!)! Print out multiple copies of a design, color and embellish it in different ways, and surprise different people with your handiwork. Thanks to Color & Creativity Enthusiast Leitha Hunt for her beautiful color pencil art on the ‘Thanks for your support’ version. 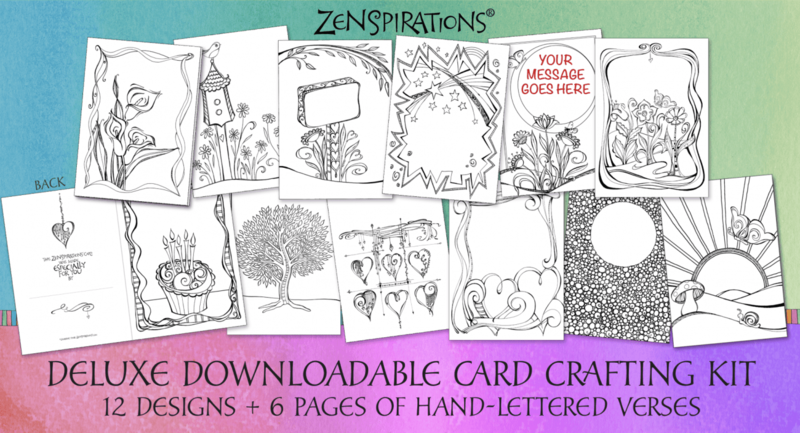 The Downloadable Card Crafting kit is the latest addition to the ZenspirationsDesigns Etsy Shop. I hope you’ll share what you do with the kit in the Zenspirations Create, Color, Pattern, Play Facebook Group. Before closing tonight, I would like to know if you are more interested in the designs, or the verses. If I offer a second collection, what kinds of cards and sayings would you like me to include? Please leave a comment to let me know– and, if you like the new collection, I’d really appreciate your letting your friends and family know about it. This is a spectacular package Joanne! What a beautiful jumpstart to cardmaking for anyone! I can’t wait to try them out!! You share your gift so generously.,…thank you for that! Oh, I love the stamp and die sets. They will be so fun to work with. Your printable cards are great too. Joanne- these are terrific, as usual 🙂 I especially like Holly Bells, Joyful Season Angels and the Dangling Ornaments. If you’re doing a new collection, I would like to see Sympathy and Thinking of You, and any verses for people who are sick and aren’t going to get well. I seem to need a lot of those these days :(. Your beautiful art will lift anyone’s spirits! I LOVE making cards!! 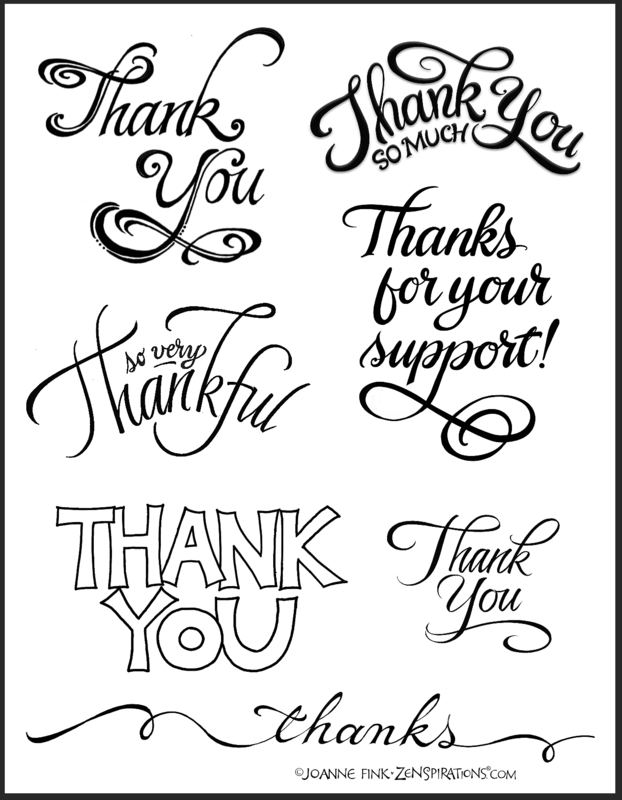 I would love to see a project with the Christmas Sentiments stamps. 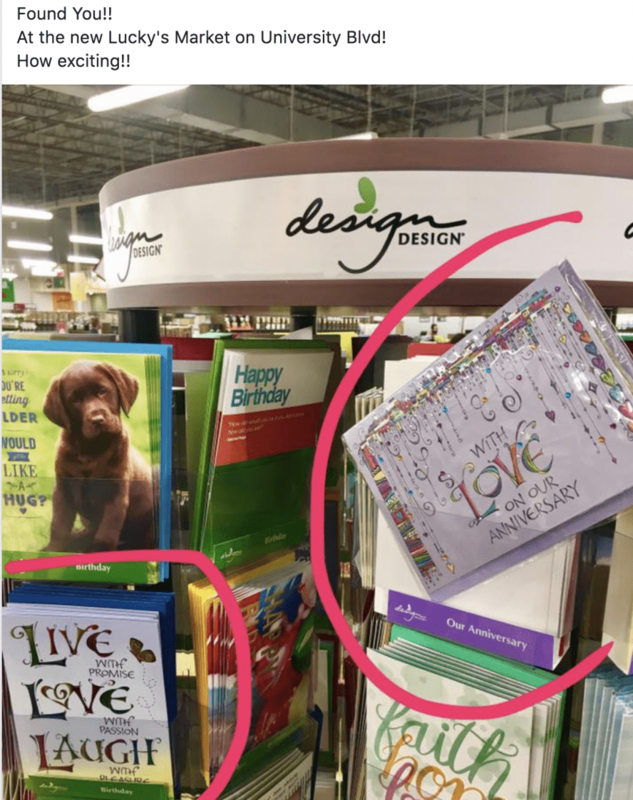 I, too, have found your cards in stores all over – the farthest being Sante Fe NM, and most recently in Deland FL. I just looked at your Shop Zenspirations page as I often do and was surprised to see great items I somehow missed before. Have you considered offering Zenspirations shop Gift Cards. With so many great new products you have, it would be a wonderful holiday wish list item. 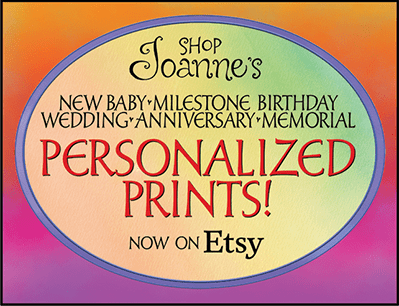 I also looked at the new card collection on your Etsy Shop. I love them! As one of the crafters in the group it’s exciting to see more ideas you are offering for crafting. The sentiments and the ornaments. Wow this is a blog I can get very excited about! You know I love card crafting. I am excited to see the new set you posted for you etsy store. I am really enjoying the spellbinders kits. 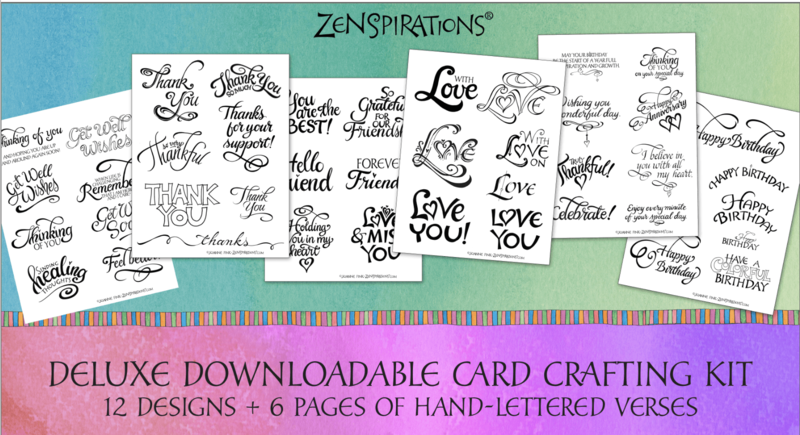 The zenspirations stamps and dies work really well and they are very detailed. Oh if there was just more hours in the day for crafting! I finally purchased your Deluxe Downloadable Card Crafting Kit!!! I’m soooooo excited to be able to use these cards and sentiments!!! Thank you so much for sharing your beautiful artwork and Calligraphy and your beautiful heart with us!! I’d love to see wedding greetings, congratulations thst can to apply to all different occasions, and some sympathy andget well greetings, etc. Your cards are so wonderful!! With much love and appreciation for you! !